INSIDE THE CAP with J.I. Halsell: Eli Manning: Elite Quarterback? On Wednesday, word broke of the contract extension of Giants quarterback Eli Manning. Unlike free agent contracts or draft pick contracts, when one determines the value of an extension contract, they must subtract from the total value of the contract, the amount of money the player was due to earn on their previous contract over the common years of both contracts. 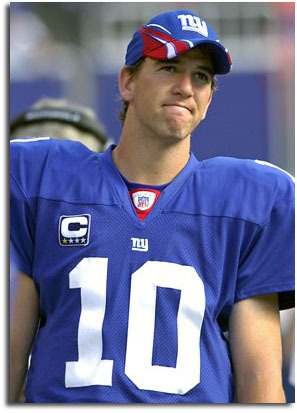 In the case of Manning, 2009 was the final year of his rookie contract, in which he was due to earn $9.4 million. The contract signed by Manning this week was reported as a seven year agreement with a total value of $106.9 million. Subtracting out the $9.4 million of old money and the old year of 2009; Manning’s contract is valued as six-new years with a new money value of $97.5 million. Another interesting aspect of contract extensions is that they often lead to the lowering of a player’s cap number; meaning Manning’s 2009 cap number of $13.8 million could possibly have been reduced as a result of a contract that has made him a richer man. How does this happen you may ask? Often the money that is guaranteed to the player is accounted for in the future years of the new contract, thereby reducing the player’s impact on the club’s cap in the first year of the deal. Given that the Giants, as of the date of this posting, have only $4 million in cap space, I’m almost certain that Manning’s new contract is providing the club a few million in cap relief. Below is an analysis of Manning’s contract relative to other quarterbacks who have signed contract extensions. You’ll see that it’s definitely a lucrative contract and a top-market deal, but it may not necessarily be the market setting contract that it’s being made out to be. As I looked at putting into context quarterback Eli Manning’s 6-year, $97.5 million contract, it really made me appreciate the contract that Bengals quarterback Carson Palmer got in 2005. Four seasons ago, Palmer got a 6-year extension worth $97 million in new money; fast forward four seasons and Manning essentially gets the same contract with the difference being the guaranteed money. Palmer’s 2005 contract awarded him $24 million guaranteed, while Manning’s contract awards him $35 million. Given the $40-plus million guarantees of defensive tackle Albert Haynesworth and number-one overall pick, quarterback Matthew Stafford, one would think that a franchise quarterback extension would garner Manning a guarantee in excess of $40 million. However, coincidentally or not, if you analyze Haynesworth’s $41 million guarantee over his seven contract years, it gives you a guarantee per year of $5.86 million. Comparatively, Manning’s $35 million guarantee over six years equates to $5.83 million; so it would appear that $5.8 million per year is a data point that equates to elite guaranteed money. Some say that Patriots quarterback Tom Brady is underpaid, but given his four-year extension signed in 2005, he did pretty well from a guarantee per year standpoint, with a figure of $6.625 million. The Three-Year Total, which represents the amount of new money the player will have earned over the first three new years of the contract, of Manning’s contract has not been reported, but if Palmer got $55.5 million in 2005 and Roethlisberger $52.7 million in 2008, then one would imagine that Manning’s Three-Year Total has to be in excess of $55 million. Roethlisberger’s Three-Year Total versus his Total New Money of $88 million gives you 59.9% of Roethlisberger’s new money being paid in the first three new years of the deal. Using that 59.9% figure and applying it to Manning’s $97.5 million contract, gives you $58.4 million of Manning’s new money being paid in the first three years if it’s similar to Roethlisberger. It’ll be interesting to find out what Manning’s actual Three-Year Total turns out to be and how similar or dissimilar it is from his peers. So what does this contract mean for Chargers quarterback Philip Rivers? Since becoming the Chargers’ starter in 2006, Rivers has been by far the more prolific quarterback of the 2004 quarterback draft class (Manning, Rivers, & Roethlisberger). Since 2006, Rivers ranks fifth in cumulative quarterback rating (93.5), while Roethlisberger (85.7) and Manning (78.9) rank 17th and 28th respectively. Clearly, Roethlisberger’s two Super Bowl rings and Manning’s one set these two quarterbacks apart from Rivers; however, Rivers’ 33-15 record as a starter shows that he’s not just putting up numbers but also leading his team to victories just as his quarterback peers of the 2004 draft class. Given the contracts given to Manning and Roethlisberger and given Rivers’ statistics and win-loss record, it would not be unreasonable for a Rivers contract to approach $40 million guaranteed and $100 million in new money. Sounds a lot like the Haynesworth contract; however, unlike the Haynesworth deal which is seven years in duration (although it’s truly a four-year, $48 million contract before a hefty bonus for the remaining three years), the Rivers deal I would expect to be a six year contract as this seems to be the popular contract term for quarterbacks. Romo, Roethlisberger, Cassel, and Palmer all signed six year extensions. Being a quarterback in the insatiable media market that is New York City is a tough undertaking; not to mention the pressures that come with being a number one overall pick and being the sibling of arguably the most prolific quarterback of this generation. Thus far, winning a Super Bowl has arguably been Manning’s only saving grace because statistically his numbers don’t exactly equate to elite quarterback status. Yet, the Giants awarded Manning a contract that pays him at an elite level. With this new contract, there’s a certain renewing of the pressure on Manning to live up to lofty expectations; I’m sure the New York media will be watching closely.